Concert Grand Compact is a high-quality piano sample library for the FREE Plogue sforzando sampled from a Steinway D concert grand piano in a world-class recording studio. 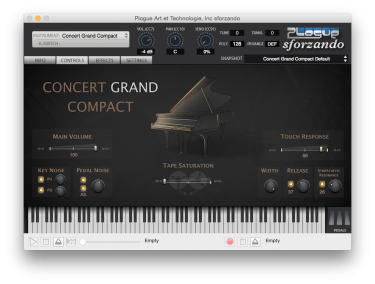 Concert Grand Compact contains samples from the larger Concert Grand (soon to be released) without the need for the Kontakt sampler. Concert Grand Compact takes arguably the best single microphone perspective from Concert Grand, our 1.3 TB Steinway D piano library, and places it in the Plogue sforzando player for a highly compact, fast loading amazing sounding virtual instrument piano that is easy to use and inspiring to play! Concert Grand Compact is ideal for Album Production, Live Stage Production, Film Score Production, Performance and more! 9′ Concert Grand Piano in your computer! 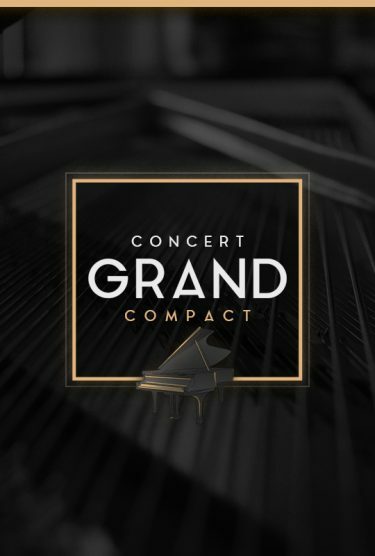 Concert Grand Compact has a FREE demo version that allows you to test drive Concert Grand Compact with just C’s and a limited range from G3 to C5, just enough to get a feel for how Concert Grand Compact will fit into your playing style. Warning: Concert Grand Compact is not without mechanical noises from the hammer mechanism! Don’t say we didn’t warn you! If you want a piano sample library that is devoid of piano noises, you should look somewhere else. If you are looking for a warm yet articulate concert grand piano, this library delivers. *Note about file size: Concert Grand Compact samples are provided in FLAC format. FLAC is a loss-less file format meaning that it will sound exactly like the uncompressed WAV source files from the sampling session but take up less than half the disk space with no audio quality degradation. Concert Grand Compact source sample size before compression is over 10 GB! The digital delivery size is just about 3 GB with no loss in quality. * Individual note velocities per note may vary slightly. Concert Grand Compact is upgradable to the full version of Concert Grand (when available), should you purchase Native Instruments Kontakt at a later time. If you are a Concert Grand Compact registered user wishing to upgrade to the full Concert Grand (not yet available), please contact support and request the upgrade. Concert Grand Compact was sampled from a New York built Steinway D with a model number starting with 589 ***, making it built after 2010. Disclamer: Production Voices is in no way associated nor endorsed by Steinway, Native Instruments, Plogue, Yamaha or any other company, product or trademark mentioned.